Every year we celebrate my Grandma Magda on August 26th, her birthday (or very close to it). We have a little party in the graveyard. 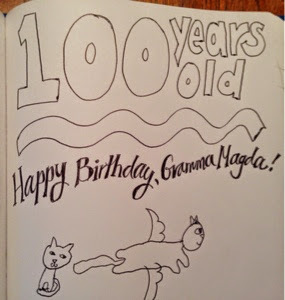 Gramma Magda would have been 100 years old! ONE HUNDRED. Whoa. Since we ate all of the chocolate cake, we brought her a bunch of unwrapped Hershey's kisses, and laid out our message on the stone. (We later moved it to the ground). I have to back up a step in the story... when we arrived at the graveyard, and stepped out of the car, Alex and Lilah were teasing each other and for some reason, he threw the frisbee out into the field - except, he wasn't aiming and it flew off into the trees! Oh NO! Another Aerobie lost. :-( We searched and searched, but it is probably up there in the tree tops or off in the dense poison ivy. While Alex and Mom kept searching, Lilah and I laid out the Kisses. She was really distressed when she realized that there wouldn't be any chocolate left for her to EAT when the letters were complete. I suggested she write "LUV" instead of "LOVE" - it's much more Kiss-efficient. 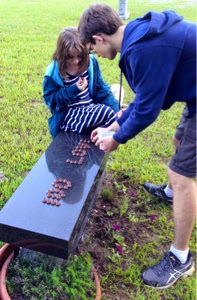 I found myself thinking - when I am 100 years old - if I am not still happily alive - I want to know that my kids, grandkids and great-grandchildren are remembering me, telling silly stories about me, and smearing chocolate on my headstone! As for the frisbee... we could tell Alex felt really bad about that. But Lilah and I decided we'd "manifest" it. We asked any watching spirits - especially our Gramma-Bear (see the bear on the stone?) - to please return the frisbee to the gravestone. We promised to come and check. 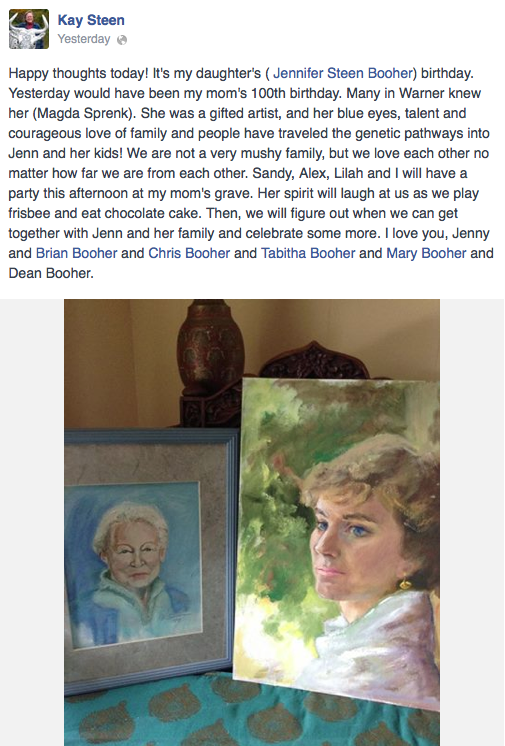 My mom also would have been 100 this year, so on her birthday her family (in different parts of the country) had her favorite beverage, a mudslide, and posted pictures on FB. 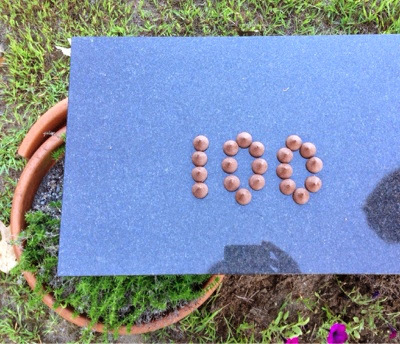 Dad's would have been 100 is next month. We will all celebrate his 100 years too. What a wonderful heartwarming story. Thank you for sharing, Sandy! 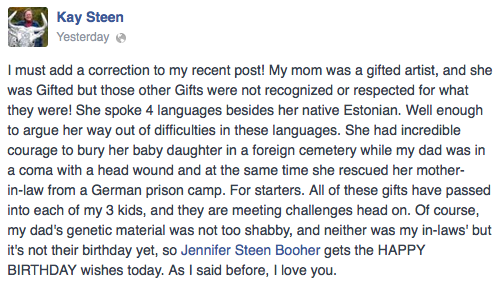 Wonderful story! And now about your 100th (I'm 70, so I do think about the subject of death and what gifts I leave behind), the trend is to cremation, so depending on what body of water I land in, my relatives can honor me by boat, yacht, or cruise ship. That said, when I'm 100, my daughters (twins) will be 75 and I really don't know if they will be all that nostalgic. They will probably be having the thoughts and worries that I am now having at 70. My grandkids will be in their mid-30s and may be concerned about their aging parents . . . it would be nice to think that there are some great grandkids in the mix. I wonder if we will know each other very well. Bottom line - everyone loves a boat ride, so maybe my husband and I can leave cruise tickets for everyone in our family to be used during this transitional period. I don't know if anyone can have an annual picnic celebrating our lives together, but at least everyone can have a cruise-line provided feast for as long as they are on the boat . . . 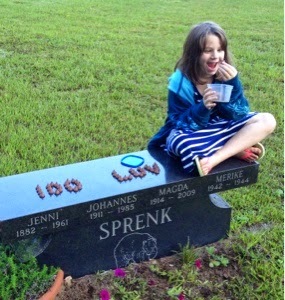 If I outlive you, I promise to smear chocolate on whatever memorial you left behind. If I feel lazy, I'll just pour Hershey's syrup over you. Would you like whipped cream and a cherry with that? Thanks Jenn! Very comforting to know. AlphaTangled Contest - The Winners! AlphaTangled Contest - The Entries!